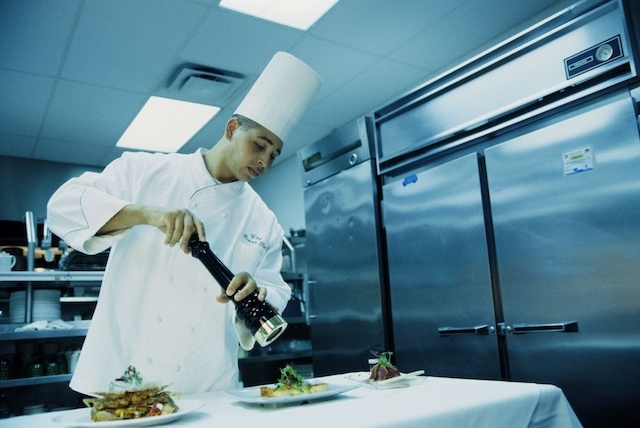 One of the most ubiquitous designs in the food industry is the chef jacket--the crisp, white, double-breasted uniform immediately identifies an individual's profession and position within the kitchen. But how did the chef jacket become the staple of kitchen wardrobe? And what do all the parts mean? Today we’ll take a look at this critical part of the kitchen uniform and learn more. When Was The Chef Jacket Made Popular? While the chef jacket as we know it didn’t become popular until 1878, there were examples of the style found much earlier. In 1822 a French artist named Marie-Antoine Careme debuted a famous sketch that depicted two chefs wearing the coat, chef’s hat, an apron, and the trousers that have become the formal attire of chefs today. The sketch was titled “Le Maitre d’Hotel Francais,” and while excessively formal, is still an excellent example of chef wear to this day. Why Do You Have A Towel? If you’ve ever noticed that many chefs will have a towel tucked into their waistband you might be interested to know that it’s for very practical reasons. A towel is a highly functional tool in a busy kitchen. Not only can it be used to keep things clean and tidy, but it can be used to help grab cooking utensils, pots, and bowls to prevent burns. Why Are Chef’s Jackets White? White is a universal symbol of cleanliness and purity--so a white coat can help viewers to trust that their food is prepared in proper conditions. It also can help to establish a sense of power and influence with both customers and kitchen help. While white can easily show stains, it’s also easier to bleach and clean. Are all Chef’s Jackets Double Breasted? The double-breasted nature of chefs coats serves two purposes. On the one hand, it looks very professional and regal, emphasizing the artistry of the chef wearing it. On the other, the double layer of fabric can help keep the wearer safe from steam, kitchen hazards, and splashing liquids. You may also notice that there are no buttons on a chef jacket, they rely on knotted cloth instead, this is so that there are no pieces of metal or plastic from buttons that could be popped off and into the food. Want to get started with our services? Do you have questions about our services? Contact us today by calling 410-558-3360 or visit the contact us page . Do you enjoy clicking “Like" and “Follow" throughout the day? Be sure to visit our official pages on Google+, Facebook,Pinterest, and Twitter today!